Book by Nov 30 and receive a $250 discount! For more information or too book email info@lacucinasabina.com or call (U.S. number) 727-560-7430. 19-25, 2019. You’ll join these successful, talented and hunky men as they tour the Roman countryside cooking and exploring during this highly acclaimed vacation. Past guests thoroughly enjoy this week and always remark that it is much more than they expected and that it feels so authentically like Italy. 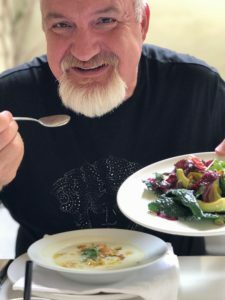 You may know successful restaurateur Art Smith as former personal chef to Oprah, and now caterer for Lady Gaga and other celebrities. 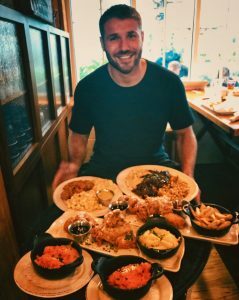 Straight ally Ben Cohen is not just a handsome rugby star, he is also a gay icon and founder of The Ben Cohen Stand Up Foundation dedicated to anti- bullying . Italian fried chicken party hosted by Chef Art Smith and Rugby Star Ben Cohen. A day in Rome including: guided art and culture tour, free time for shopping, dinner at trendy restaurant roof top deck with a 360 panoramic view of the skyline and sunset over Rome. Book by November 30 for a $250 spa package per couple (massage, Presecco and Tuscan olive oil lotion). For more information or too book email info@lacucinasabina.com or call (U.S. number) 727-560-7430. This post is brought to you be our partner La Cucina Sabina.